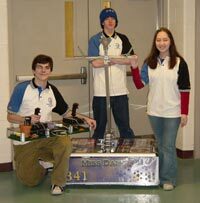 In 2005, the Wissahickon Senior High School Robotics Team lost their partner, North Montco Technical Career Center. By losing two advisors, team members, and a building facility, Miss Daisy had a rough start to the new season. The team made it out strong however, due to the support from parents and the school administration for allowing the team to use the high school facilities. The team earned national recognition at the National as it was named an honorable mention of the Chairman’s Award. Team 341 also took home the Judges Award at the National in Atlanta. TRIPLE PLAY™ uses red and blue wire-framed tetrahedrons called “tetras” as game pieces. There are also larger tetrahedral goals that are placed at nine points around the field, forming a tic-tac-toe shape. Additionally, four “vision tetras” with green surfaces inside start near the center of the field. During the first 15 seconds of the match (the autonomous period), robots can use camera sensors to find the vision tetras and then place them in the goals. For the remaining two minutes of the match (the tele-operated period), robots can pick up tetras, and place them inside or on top of a goal. 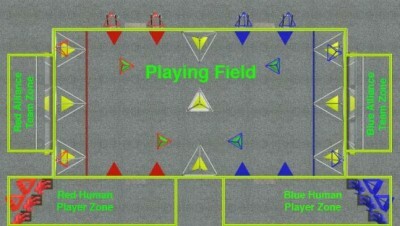 tetras can be obtained at the edges of the field, either from the automated loading zones, or from the human players. 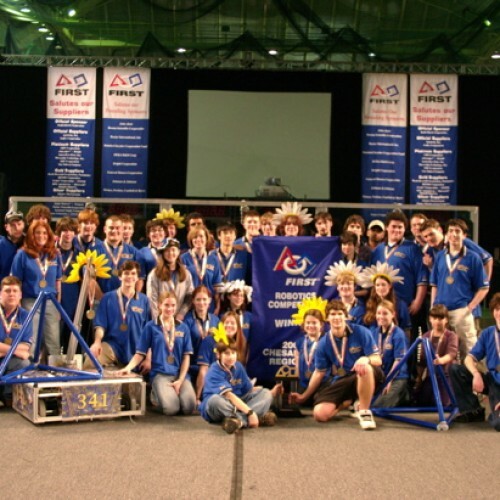 A tetra placed inside a goal earns 1 point for the alliance of its color. However, if stacked on top of a goal, a tetra is worth 3 points. Tetras can be continually stacked on top of each other, and a goal is “owned” by the alliance that owns the topmost stacked tetra. If an alliance owns three goals in a row, 10 bonus points are awarded. Finally, if all three robots of an alliance are in their corresponding end zone at the end of the match, 10 bonus points are awarded to that alliance.